I made a bunch of great new books the last couple evenings that I'm really excited about, so it's driving me kind of crazy that I haven't had a chance to photograph them (and probably won't for a couple days). 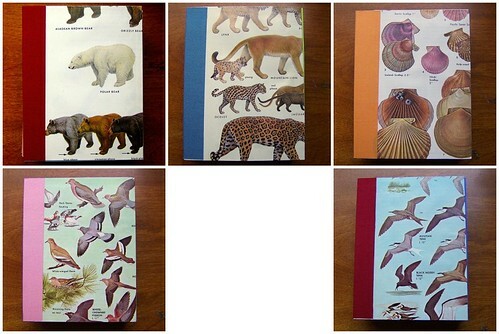 Instead of dwelling on that, I decided to post about some awesome animal notebooks that I've listed in the shop recently. Yep, those are them pictured above. Clockwise from top left we have bears and goats, cats and foxes, scallop shells, terns and pigeons and doves. these are fabulous! i love guidebooks and the way they look and feel--very cool idea! Beautiful books! I love the one with the cats.